Adam B. Carrico, a seminarian in priesthood formation for the Archdiocese of Louisville, will be ordained a deacon on Saturday, April 27, at 11 a.m. in his home parish, St. Aloysius Church in Pewee Valley, Ky.
Ordination to the diaconate is one step in the formation process for priesthood. Seminarians are typically ordained to the diaconate a year before their presbyteral ordination. Carrico, 30, is one of four children of Susan and Larry Carrico. He’s a graduate of St. Xavier High School and the University of Louisville. He grew up at St. Aloysius and felt his first calling to the priesthood at the parish school, he explained during a recent interview. He wrestled with the idea of a religious vocation through high school and college. His discernment was fed by three things he believes were planted in him at baptism. He had a desire to serve people, to be committed to a community that would help him sustain his service and to live for something “larger than myself, to have a purpose,” he said. These desires were affirmed when at age 16 he began working at a nursing home called Friendship Manor. He worked there to help pay tuition at St. Xavier and continued working there in college. More recently, Carrico has felt called to work especially with young people. His younger brother committed suicide just after Christmas, on the feast of the Holy Family. “I have always felt committed to being there for people during their darkest hours,” he said, “and while this experience with my brother’s death has caused me immense grief which I have only now just begun the process of working through, I feel a deeper connection to those who suffer such things which words fail to describe. “Being there for people, particularly young people, who feel like everyone — including God — has abandoned them is a particularly intense calling that I have,” he said. After his ordination, Carrico will be assigned to parish ministry for the summer and then in the fall, he will resume studies at St. Meinrad School of Theology. He will also serve as a deacon at St. Francis Xavier Church in Mount Washington, Ky., and All Saints Church in Taylorsville, Ky. 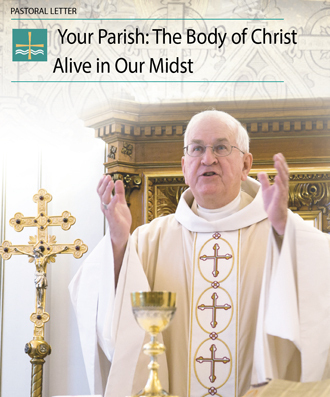 He is currently serving at those parishes in catechetical ministry. Carrico also has a blog which he hasn’t updated lately but intends to update after ordination. He plans to post homilies there and hopes that it becomes a vehicle for conversation after Mass. The address is: https://www.harvesterswanted.blogspot.com.